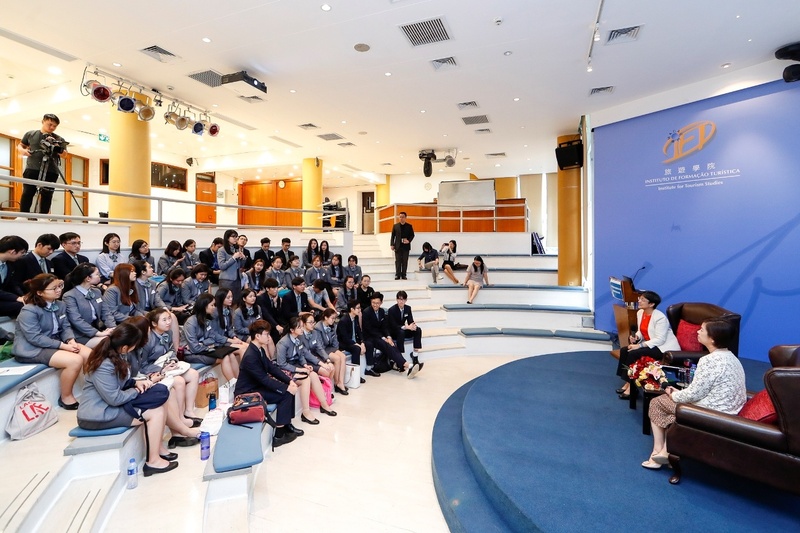 Macao Government Tourism Office (MGTO) hosted the second dialogue session yesterday (3 May) between youths and MGTO Director Maria Helena de Senna Fernandes, who shared her experience in participating at conferences and events organized by international tourism organizations. 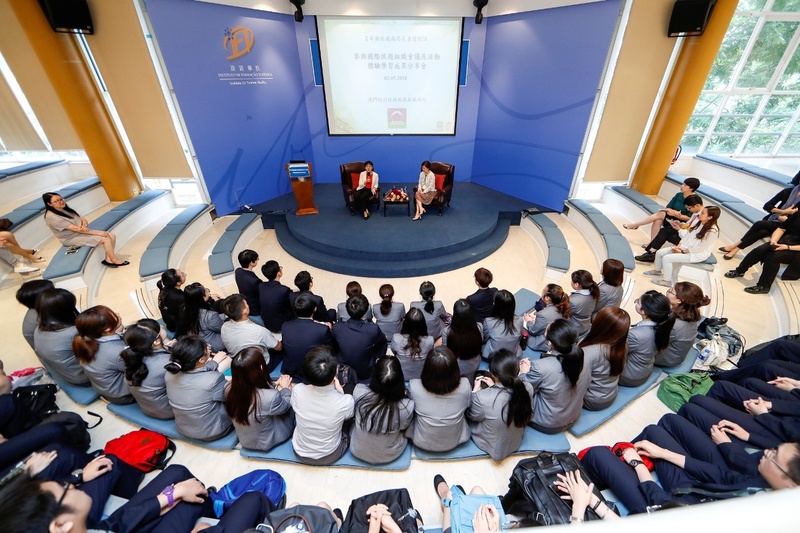 During enthusiastic discussions with students, she encouraged them to dive into open communication with other people holding different stances, build their career in Macao and embrace the world. 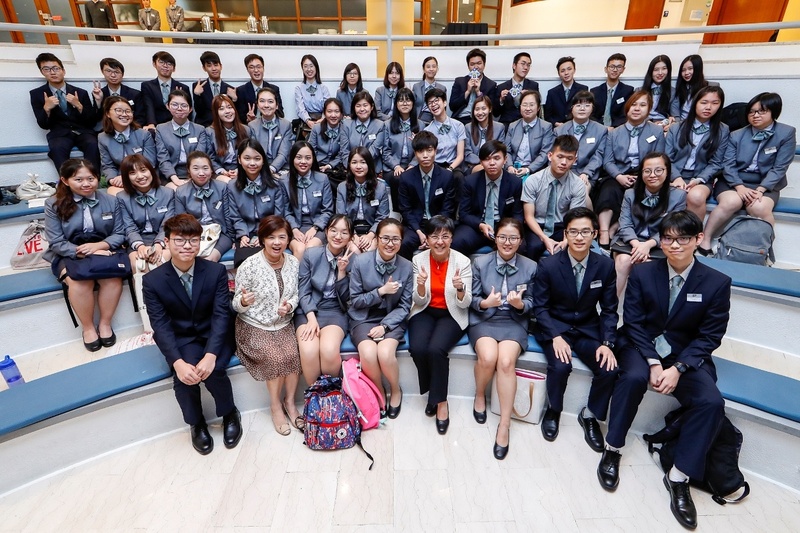 MGTO Director Maria Helena de Senna Fernandes and Head of Communication and External Relations Department of MGTO, Kathy Iong, met around 50 students of the Institute for Tourism Studies (IFT) for an exuberant dialogue. Director Senna Fernandes first presented an overview of Macao’s engagement in international tourism organizations, the results achieved from international meetings and events hosted by Macao as well as their impact on local tourism development. She also shared about the participation of local tertiary students in meetings and activities held by international tourism organizations in Macao and overseas. Following the presentation, she engaged in a lively discussion and exchange of opinions with students, who enthusiastically raised their questions and shared their points of view. Macao has long been a place of beautiful encounters between cultural influences from East and West over the past centuries, a bridge that connects different peoples of the world. By engaging in meetings and events organized by international tourism organizations, it becomes another powerful way to connect Macao with the world. Not only can the voices of Macao reach different corners of the globe, the city can also contribute to regional and international cooperation with the advantages given by its policy, geographical location and culture. With the tourism outlook full of promise, some students wondered how to thrive with opportunities in the tourism industry. Senna Fernandes emboldened students with a passion for tourism careers to equip themselves and actively get involved in community activities and those organized by social organizations. She also encouraged them to reach out, talk and listen to people of different professions so as to widen their perspectives and social networks in real life. It will also enrich the topics they can share with others and help them build connections in the future. She hopes students can build their career in Macao and embrace the world, believing in their own capabilities to contribute to a brighter future for the tourism industry in Macao and the world. During the dialogue, Senna Fernandes shared about her unforgettable experience in participation at an international tourism event. In 2014, Macao hosted the 8th Asia-Pacific Economic Cooperation (APEC) Tourism Ministerial Meeting. The Meeting was of great significance and involved an array of high-level and high-standard arrangements. No arrangement was allowed to go wrong at any level throughout the event. The pressure was so overwhelming that even a person who rarely had insomnia due to work like Director Senna Fernandes became sleepless because of the event. At the end, the Meeting was smoothly held under the efforts of different sectors and the success was a great relief to her. As one of the coordinators for the Meeting, she believes that applying what she learned from her experience in joining and organizing other international organization meetings was of great help to her work. Students grasped the meaning of Director’s advice with quick wits and put it into action right away – to engage in more conversations with a listening ear. A number of them seized the opportunity to stay after the session to talk more deeply with Director. When asked how to overcome difficulties, Director said that however great an obstacle is, it takes equally great perseverance to face the obstacle and find the way to stand firm in times of difficulties. She quoted the saying of Secretary for Social Affairs and Culture Alexis Tam – never give up on doing what is right, to encourage students to step up to new challenges in life. Student Ho said that she is very fond of her birthplace Macao. She believes that joining the tourism industry not only can help her build her future in Macao but also will open the door for her to the world. She hopes to pursue a career path in tourism and apply what she has learned from school at work after graduation. Originally from Zhuhai, student Xiao expressed that she found the content of the dialogue fairly interesting. Director Senna Fernandes talked with students in such a warm way just like her senior schoolmate and shared so much positive energy. She chuckled that it was beyond her expectation Director would experience insomnia too. She looks forward to joining similar exchange sessions in the future again.